Prevention of the penetration of water/moisture into and through the facade of a structure is an essential part of maintaining the integrity of the building. UBER provides the expertise and staffing to identify and remedy such problems, including repairing and undoing work that was either poorly designed or inexpertly executed when the structure was built or renovated. Application of the appropriate sealants and coatings to joints and processes which are properly designed and installed can significantly improve the structure’s integrity and reduce future expenditures for repair. 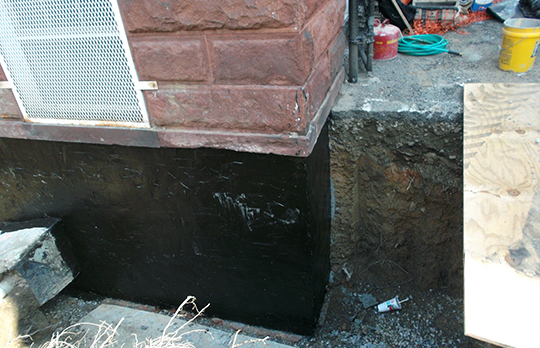 Seal penetrations/joints between construction elements are a critical part of the building envelope. Sealants will be selected for the type of joint (moving or non-moving) as well as for the materials being sealed, as well as for their ability to prevent water damage, concrete corrosion, structural steel damage and mold development. We provide a wide range of applications to address structural exteriors where waterproofing coatings are required. Available coating products will be matched to the specific materials utilized in the structure as well as to the age of the structure, weather conditions and other variables of use and condition. Many modern structures face challenges regarding water/moisture penetration through the facade, often a few years after their completion. There can be several reasons, including unsealed flashing laps or flashings that are cut back behind the face of the exterior brick. UBER has experience in identifying and addressing these problems and can provide upgrades to a building’s flashings to correct these flaws and secure both the exterior and interior of the structure.